Central Utah thrust belt with colored band (yellow) showing area of greatest oil potential; Covenant oil field, Sevier County, Utah, is by the town of Sigurd. You can’t miss it! Drive south of Interstate 70 on State Highway 24, and a few miles past Sigurd you’ll see the “elephant” – oil patch jargon for a major oil discovery. Just east of the highway is a large drilling rig, wellhead, and a battery of eight tanks, each capable of storing 400 barrels of crude oil. 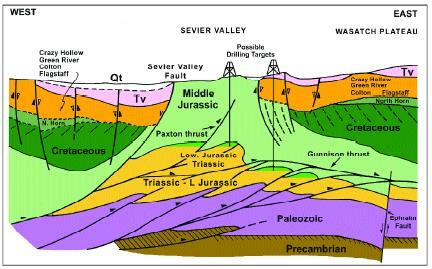 The wellhead, also called a “Christmas tree,” is on the discovery well for the Covenant oil field in Sevier County, the only oil field for over 100 miles. It just may be the first of several huge “elephants” in central Utah. The No. 17-1 Kings Meadow Ranches discovery well, drilled by Michigan-based Wolverine Oil & Gas Company, reportedly is pumping nearly 900 barrels of oil per day, and the field has already produced over 210,000 barrels since May 2004. At least nine additional wells are planned to develop the new field, which may contain several hundred million barrels of oil. 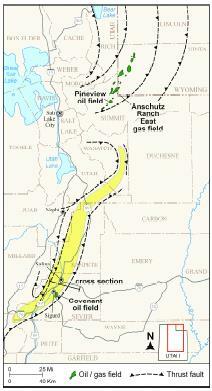 The last major new oil find in Utah was the 1975 discovery of Pineview field east of Coalville in Summit County in the northern part of the state. Pineview has produced over 31 million barrels of oil and is still pumping nearly 15,000 barrels each month. Oil companies have been exploring central Utah off and on for over 50 years, with no success until now. So why did it take so long to find oil in this area? The main reason is the extremely complex geology. This region is part of the central Utah thrust belt, also referred to by geologists as “the Hingeline.” The Hingeline basically follows Interstate 15 south from Nephi to the southwest corner of the state. Throughout this area’s geologic history, the Hingeline has marked a pronounced boundary between different terrains. During Late Proterozoic to Devonian time (1 billion to 360 million years ago), it marked the boundary between a very thick sequence of sediments deposited in western Utah and a thin sequence deposited in eastern Utah. Later, the Hingeline coincided with the eastern edge of a mountain belt that formed during the Sevier orogeny, a mountain- building period that took place during Cretaceous to early Tertiary time (about 140 to 50 million years ago). Today it marks the general boundary between the Basin and Range and the Colorado Plateau physiographic provinces. During the Sevier orogeny, compressional forces produced stacks of thrust faults – low-angle faults that moved huge sheets of older rock tens of miles eastward over younger rocks. To better understand this phenomenon, imagine you are in a cafeteria and place your tray on a conveyor belt with other trays. If one tray were to get jammed, the other trays would stack up and slide over each other, similar to the process of thrust faulting. Associated with thrust faults are large anticlines, folds in the rocks between the faults. The crests of these anticlines are some of the best places to trap oil. 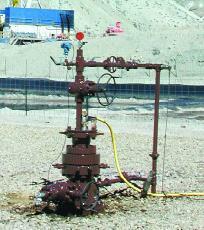 Pineview and other fields in Summit County produce oil and gas from these types of features. The Covenant discovery demonstrates central Utah has all “the right stuff” – large anticlines, source rock, reservoir rock, sealing rock, and good timing. However, the Arapien Shale, which outcrops at the No. 17-1 Kings Meadow Ranches well site and along the eastern side of Sevier Valley, as well as underlies the farmland in much of the valley, adds another level of complexity to the geology. The outcrops at the well and especially near the mouth of Salina Canyon are typically highly contorted and faulted. This is due to the plastic nature of the Arapien; the mudstone and evaporite beds are favored locations for thrust faults, and they have a tendency to flow when squeezed and compressed. As a result, what you see at the surface does not necessarily reflect what exists 7000 feet below. Thus, the real trick is to identify deep drilling targets using state-of-the-art seismic data, three-dimensional models, well information, high-quality surface geologic maps, geochemical analyses, and other techniques. Wolverine believes there may be 25 additional geologic structures in central Utah that could contain oil reserves comparable to Pineview or Anschutz Ranch East fields. The latter, also located in Summit County, has produced nearly 128 million barrels of oil. The company is conducting a seismic program (460 miles of lines) to further define these and identify other potential features. Industry interest in the area is extremely high. Recent lease rates of federal (Bureau of Land Management) and state (School and Institutional Trust Lands Administration) lands range from $10 to over $1200 an acre….. The Covenant oil field discovery is not a real elephant, but a potentially huge economic boom to Sevier and surrounding counties, and the state of Utah. If the oil reserve estimates of the area become reality, Utah will make a significant contribution in reducing the nation’s dependency on foreign oil.